Eggplant, tomatoes, okra, purple hull peas, apples, cantaloupes and watermelons are still coming in. It’s a great time of year for seasonal eating. The temperature plummeted this week. From steamy days in the 90’s (“feels like 118” my weather page said), this morning I awoke to 59. And it finally rained, settling the sun-baked dust. Our fall garden loves the cool weather, and the nice drink of water. I planted collards, kale, turnip greens, Swiss chard, spinach, turnips, mustard greens, Brussels sprouts, beets, Tokyo Bekana, mizuna, bok choy, komatsuna, tatsoi, Chinese cabbage, cabbage, broccoli, cauliflower and arugula. Yesterday I dug under a couple of the sweet potato vines and was pleased to discover nice fat tubers. I’ll probably start digging them in a couple of weeks. So I just read that at the state fair this year there will be a supper of all local foods. Those who attend will have the opportunity to meet the farmers who grew the food. Ticket price is fifty dollars. This just makes me chuckle and shake my head. Was it really that long ago when most of the people who attended the fair were farmers? When the idea of paying $50 to meet farmers and eat homegrown food would have seemed ridiculous? Maybe they should just set up a tent next to the one with two-headed lady or the monkey-boy, and put some real live farmers in it. Of the benefits and importance of homesteading, I’m more convinced than ever. Of the food movement, not so much. I know this sort of thing is well-intended, and I’m sure the farmers participating are glad to have the market, but I wonder how many people realize how out-of-touch this is with the realities of rural life. On a less grumpy note, this is a great time of year for seasonal eating. We don’t have fresh fruit much of the year. But now we have cantaloupes, watermelons and apples. My fruity breakfast was delicious. I’ve heard from several people that the old house on our farm wasn’t built in its present location, but was moved there. We recently toured a historic building in Hillsborough that was moved several miles in the 19th century, to its current location. I had an understanding of how structures are moved today: they’re lifted with hydraulic jacks then positioned beneath a large trailer hitched to a truck. But how were they moved back before hydraulics and trucks? By employing jacks, the church was first lifted off its foundation; heavy beams, greased and with pointed ends, were secured to the underside, which would act like runners on a sled. A temporary wooden track made of flat planks and cross ties (similar to railroad tracks) were laid on the roadway, and the structure was pulled across the track on the greased beams. Once part of the track was cleared, workers would move and install the track at the front of the structure, and the job continued. 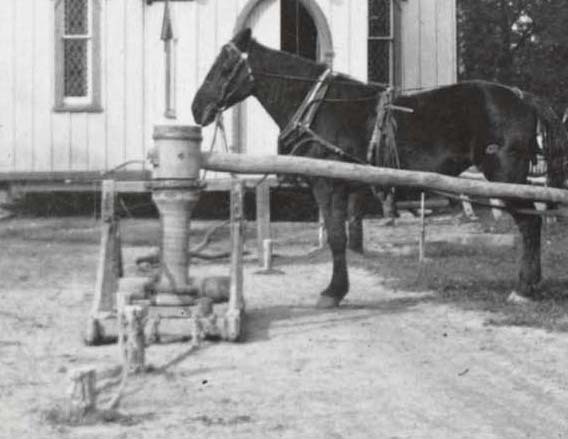 Capstan and horse used to pull the Church along, 1891. Image courtesy of Traverse Area District Library Local History Collection. A capstan was necessary to apply enough force to move the church, as a lone horse wouldn’t be strong enough on its own. This capstan operated much like the ones seen on ships to raise anchor. In the photograph, you can see the capstan was moored in the roadway with large posts driven into the ground and attached with chains. The horse would rotate the axle by walking in a circle and would pull the structure along the temporary track. As the picture was taken while the horse was resting, the chains mooring the capstan to the ground are slack. I’m continually amazed at what our predecessors were able to accomplish without the machinery we take for granted today. It’s a good time of year to be a person here. It’s also a good time of year to be a chicken. The Cream Legbar chicks a neighbor gave us are growing up. This guy’s hoarse attempts at crowing are improving rapidly. Our bad luck with broody hens continues. Once again we’ve had a total failure with a clutch. 12 eggs–zero hatched. I removed the eggs before they exploded, but the hen hasn’t given up her spot. She continues to sit there, with no eggs beneath her. Chickens are certainly not the brightest creatures on the farm. On the other hand, for the first time ever we’ve had a kid born in August. Our goat Jade delivered a stillborn kid this winter and not long after that she went into season. Usually goats time their cycles to deliver in cooler weather. It’s a treat to have the little dude on the farm, even though he’ll have to grow up without any playmates his age. And, in the most blistering sultry heat I’ve ever experienced here, I got the big fall garden planted. Some interesting take-aways from a talk by Roland Fusami, Senior Analyst for RaboResearch Food and Agribusiness, from Vegetable Grower magazine. –Only 19.7% of Millennial food purchases are at traditional retailers (versus 42% by GenX, 54% by Boomers, and 55% by the Silent Generation). –Online food and beverage sales will grow dramatically, in a short period of time. –Farmer’s market sales and traffic are dropping. The older people who used to come and buy produce by the bushel (for canning, for example) aren’t coming any more. Many of the 20-somethings who used to do their grocery shopping at the farmer’s market aren’t either (perhaps because the trendiness has faded). Instead of buying the ingredients for a weeks’ worth of meals, many folks now just buy one or two items–a tomato or two, for example. –Despite the push to encourage people use their SNAP benefits (food stamps) at the farmer’s market, sales are minuscule. At our market benefits are doubled. It’s the best deal in town. Yet very few people take advantage of it. –Convenience does seem to be the number one factor, rather than taste or price. Foods that require effort to process/prepare don’t sell as well as foods that don’t. Offering to deliver the food to the customers’ homes can increase sales. –Food prices are dropping so low that it’s hard to compete for the price-sensitive shopper. Aldi now sells eggs for less than fifty cents per dozen. Ours are $5/dozen. Aldi has also increased its organic inventory. Lidl will be opening here soon and I’m told that their prices are even lower than Aldi’s. None of that is particularly discouraging as long as you’re not trying to make a living growing vegetables on a small scale. It’s a great time to be a homesteader. That will hopefully always be true. After a very strong start, our tomatoes have rather suddenly bitten the proverbial dust. The German Johnsons growing outside have nearly all succumbed to blight and it looks like the three varieties in the hoop house are soon to follow. Blight is airborne and might have floated into the hoop house on its own, but I suspect the vector was me. Before I realized the significance of what I was doing, I would sometimes pick the tomatoes growing outside, then go into the hoop house and pick those. Big mistake. I think it likely that I carried the blight into the hoop house on my arms and clothes. Once I realized the risk, I always picked in the hoop house first and never went into the hoop house after working with the outside tomatoes, without first showering and changing clothes. Chalk it up as an important lesson learned. But, in any event, I’ve eaten a lot of tomato sandwiches. And of course we’ve enjoyed them plenty of other ways too, and the cupboard is fully stocked with sauce and salsa. And even as the vines die, there’s still plenty of tomatoes to keep us happy for a while yet.